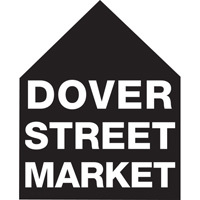 Dover Street Market is a multi-brand retailer originally located on Dover Street, in Mayfair, London. It has stores in New York City, Tokyo, Singapore, Beijing and Los Angeles. Dover Street Market was created by Rei Kawakubo of Japanese fashion label Comme des Garçons and her husband Adrian Joffe. The store sells all Comme des Garçons brands and complementary high fashion brands, young creations, streetwear such as Balenciaga, Brain Dead, Céline, Daniela Gregis, Dreamland Syndicate, Golf Wang, Gucci, Hussein Chalayan, J.W.Anderson, Lanvin, LOEWE, Maison Margiela, Marni, Nike, Proenza Schouler, Ovelia Transtoto, Raf Simons, Rick Owens, Roberts Wood, sacai, Stussy, The Row, Thom Browne, Valentino, Vans, Vetements and many other brands. Dover Street Market is often described as a departement store or a concept store, however the shop offers a different approach to retail, pushing the boundaries of what retail should be. The concept behind it, was to construct a new kind of shop that would celebrate creativity, decry comformity and ignore established principles of retail. A place where streetwear would collide with luxury, young designers would line up with world famous icons, artists would interfere in the installations, designers would be free to make their own spaces. Aiming to create a beautiful chaos. The first Dover Street Market openend on September 10th 2004 on 17–18 Dover Street, in Mayfair, London. In March 2016 the original store relocated to the former Burberry building (erected in 1912 by Thomas Burberry) on Haymarket (South Piccadilly). The original Dover Street Market (17-18 Dover Street, London) used to be home of the Institute of Contemporary Arts (ICA) in May 1950. The London store was ranked by Complex as the #2 best store in the world in 2013. Dover Street Market Ginza opened in 2006 in Tokyo. Dover Street Market Beijing, turned into a Dover Street Market in February 2018, previously a joint venture of I.T and Dover Street Market called I.T Beijing Market. The London, Tokyo and New York stores all have a Rose Bakery café, created by Rose Carrarini and her husband Jean Charles. ^ a b Linda G. Miller. "In the News". AIA New York. Retrieved February 19, 2017. ^ Melissa Heng. "Dover Street Market Singapore opens on Saturday with fresh spin on retail". The Strait Times. Retrieved July 28, 2017. This page was last edited on 20 March 2019, at 23:25 (UTC).